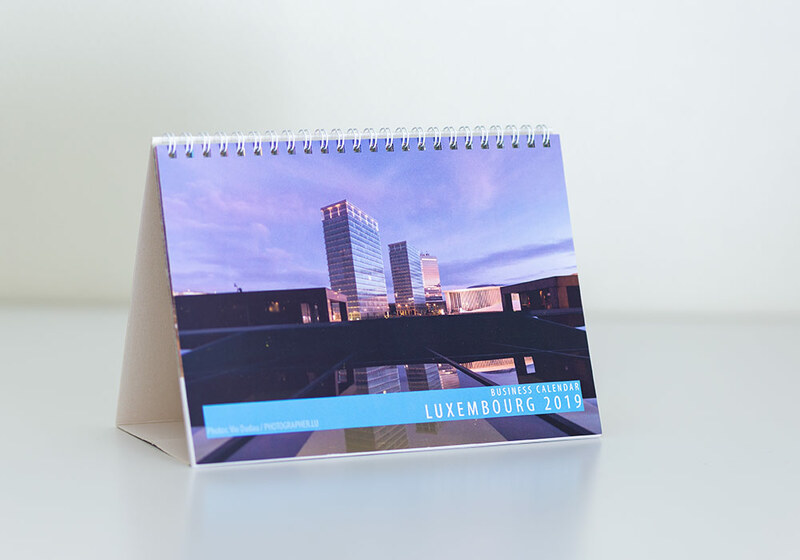 The 2019 Luxembourg Business Calendar celebrates the places of doing business in Luxembourg city. It includes pictures of the major business centers in Luxembourg city, like Kirchberg, Glacis, Place de l’Etoile, Clausen, the downtown and so on. It’s a desk calendar, in A5 size (15×21 cm), small enough to place it on your desk, yet big enough for you to enjoy the pictures. It has 13 pages: one for each month + cover. The name of months and captions of photos are written in English, while the days of the week are written in Luxembourgish, French, English and German. If you’re thinking of ordering a large batch for your company (over 50 pieces), I can include your logo and contact details on the cover and in the footer of each page. Just let me know of this before you order.